Welcome to the nook where I as a writer struggle to become an author. The Iron Horse Chronicles is being created here. I wrote the first outline and began assembling research notes for my trilogy at this desk nine years ago. Most of the writing of the three books occurred here, although portions were written in a suite during various visits to the Colorado Belle Resort in Laughlin, Nevada, and portions in a stateroom onboard the Golden Princess on a cruise to the Hawaiian Islands. The Dell PC is my primary writing instrument. The Gateway laptop provides access to research while writing and serves as the primary tool when traveling. I write in Word on a Windows 7 operating system. 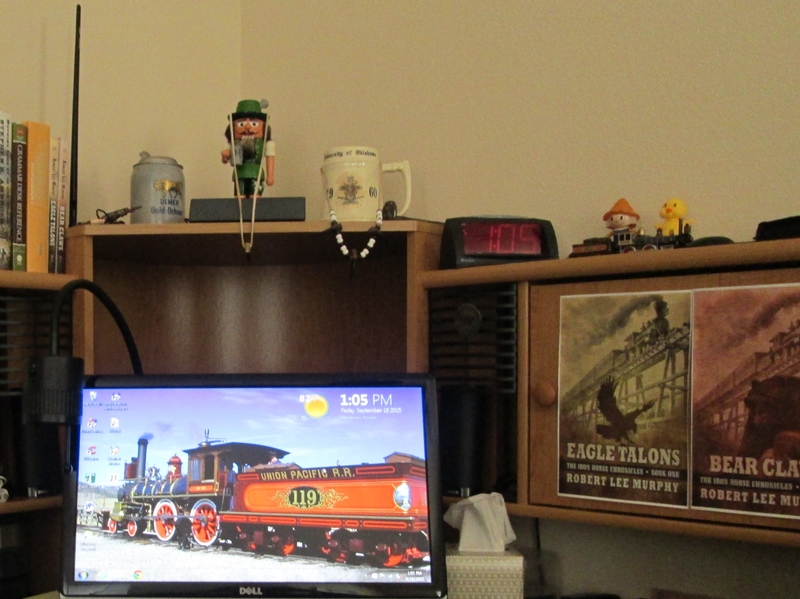 The left-hand cabinet door is my bulletin board where I post the historic timeline and post-it notes to jog my memory while writing book three, Golden Spike. Within easy reach on top of the left cabinet are the books to which I refer while writing. 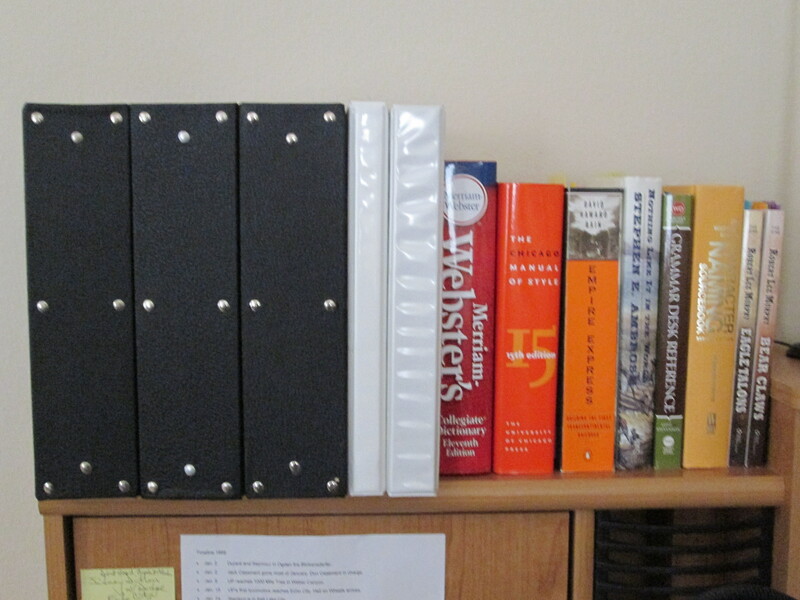 Each black binder contains the manuscript of one book in the trilogy. The thin white binder contains my contracts with and guidance from Five Star Publishing. The wide white binder is my “writer’s bible.” It contains the outline of the novel I’m currently writing, details about fictional and historical characters, maps, calendars, historical notes, and other information. Scattered across the top of the cabinet are memorabilia. Hanging from the nutcracker is the eagle talon necklace Lauren Beth Murphy, aka Jenny McNabb, made and wore at the book signing for Eagle Talons at the South Point Casino in Las Vegas in 2014. Hanging from my fraternity mug is the eagle talon necklace that graced the display cabinet in the Sun City Anthem Recreation Center when Eagle Talons was featured last year. 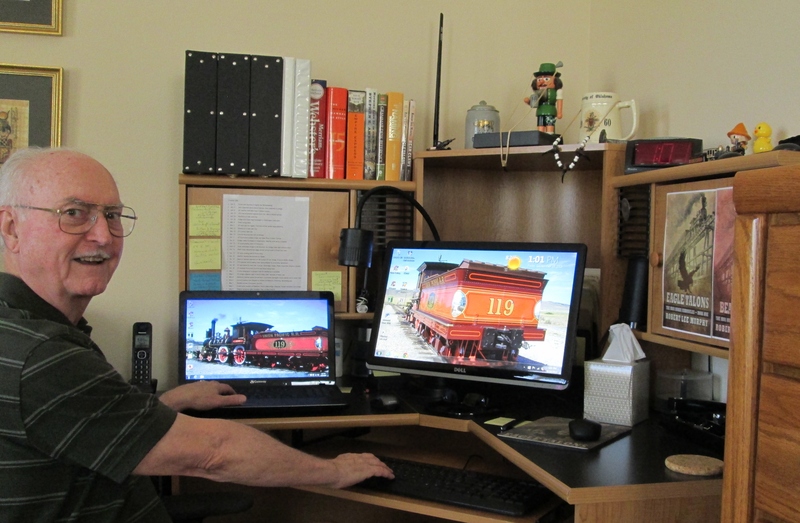 Next to the clock is the HO model of Union Pacific Locomotive #119, which was also displayed by Anthem Authors last year. The header of this website shows #119 at Promontory Summit, Utah, as do the screensaver photos on both computers. I hope I haven’t bored you with this post. The idea came from my friend and fellow Western Writers of America author Lucia St. Clair Robson, who recently shared a photo of her office on Facebook. This entry was posted in Bear Claws - Book Two, Eagle Talons - Book One, Golden Spike - Book Three, The Iron Horse Chronicles, Transcontinental Railroad, Writing and tagged Adventure Fiction, Bear Claws, Eagle Talons, Five Star Publishing, Frontier Fiction, Golden Spike, Historical Fiction, Jenny McNabb, Middle Grade Fiction, Teen Fiction, The Iron Horse Chronicles, Western Fiction, Western Writers of America, Young Readers. Bookmark the permalink. Very interesting Bob. I have been curious about how you went about your project. You are truly an exceptional fellow and I wish you continued success in all endeavors. I know it takes self discipline to get to having completion in sight. Would be interesting to know your daily routine. Ron, thanks for your good wishes. I don’t have a daily routine. Some days I write for hours, and other days I don’t write a word. I know common advice to writers is to write something everyday, but I consider writing trash to be a waste of time. I do think about the book day and night, even dream about it. I am constantly working on research. So, the trilogy is never far from my mind. I found this very interesting, and full of great organizational ideas. Thank you.